Sunday Summer check-ins ROCK! Wow, what a difference a day makes. The trip to Duck was so much better coming in Sunday morning instead of Saturday. It was great having a relaxing drive to kick-off our two-week stay in Duck this year! We were thrilled to pick up our keys early from Twiddy's office in Duck and continue on just a few blocks to our vacation home on Marlin Drive (Sea Delight B483T). This vacation home is in a fantastic location, a short walk to the beach and a bit longer stroll to the end of the street which puts you in the heart of Duck with restaurants, shops, etc. easily accessible. Duck can get rather congested if trying to get to it, or through it in the summer, especially on a rainy day, but staying in the middle of the action, everything is convenient! This home had four bedrooms and easily slept eight. It's a smaller, more traditional beach home with an open floor plan and big porches on the front and side making it feel much larger. 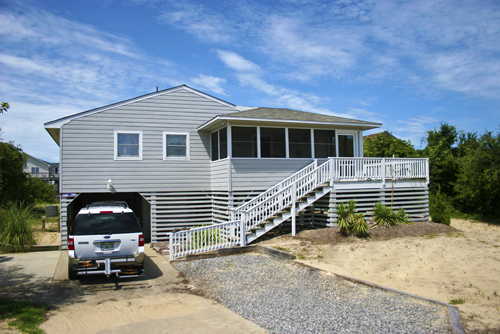 Unlike many of the traditional beach homes on the Outer Banks, this house is completely updated with a great kitchen and modern, comfortable furnishings. During the first week of our stay, my parents and brother joined the five of us and we spent most of our time on the beach. We also used the house's sand volleyball court for serious games of badminton – so much fun! One day, Will took my mom and brother out and they stopped for lunch in Corolla Village, checked out the nature center and went on a self tour of the Whalehead Club. There was some rain off and on a few days so we did puzzles, walked under our umbrella to the shops, played dominos, card and board games and watched the Olympics! We ate way too much food as once again my parents brought a giant cooler full along with batches of homemade cookies and yet they still raided the local grocery stores several times. There are no large chain stores in Duck, but Tommy’s Market, adjacent to Marlin Dr., is a fantastic source for specialty foods and hard to find gluten free items, although it is rather pricey. The last day of my family's stay we all drove up to Corolla and walked the grounds of the Currituck Beach Lighthouse while my brother and Will went up to check out the view. Then we headed over to Corolla Outback Adventures for a 4x4 tour. Years ago we drove to Carova to see the horses, but the tour is much more than this! While waiting for another group to join us, we had the opportunity to sit with Jay, the owner, and learn a little about the history of the area. Corolla Outback Adventures has access to private land off the beach where there are rolling hills and puddles (4x4 fun) and a panoramic overlook of Monkey Island. We saw many horses, beautiful houses, the canals and then we saw…… a wall of rain heading our way. We booked it back down the beach, with rain pelting those of us who didn’t get in the truck. This was hands-down my boys' favorite part of the tour! Off my family went and then Will's dad and brother came for three nights of our second week. We continued to visit the beach daily, engaging in paddleball competitions and boogie board fun! Will, his father and our younger son made a trip to Jockey's Ridge and enjoyed the climb and wonderful views. After some board games and card games and a dinner out, Will's family was gone before we knew it. Our last few days were pretty quiet in comparison and we went for walks to the sound for sunset views, enjoying the great boardwalk that runs the length of the sound from the Waterfront Shops to right across the street from the Twiddy check-in office. We ordered take out a few times taking a little break from shopping and cooking and allowing ourselves to really veg out on the beach. We had amazing weather this trip, not a single red flag, no evacuations, and a really enjoyable time in a super comfortable and perfectly located beach home. Not sure what happened on our drive home. Leaving the Outer Banks was a piece of cake on Sunday at 10. It became a little congested after we crossed the state line and we headed into Norfolk. We saw warnings about a back-up in the CBBT so we cut across and took the Monitor-Merrimack cruising through with no problems. Once we hit Hampton Roads we averaged about 15- 20 mph all the way to the 295 exit. Virginia needs to get a clue and stop embarrassing itself - widen this part of I-64, especially through Williamsburg.